"Good Tournament", and "Great Final" were nice words to hear at the end of this event. As a first time GM, I had some anxiety about doing a good job. I am glad it was well received. This year the event consisted of two preliminary heats and a final. The first round on Wednesday had 19 players seated at three games (6, 7, 6). The second round on Thursday had 15 players seated at two games (7, 8). The final was held Friday with 8 players. Unfortunately, the first place player from the preliminary rounds, Mark Giddings, was not among them. On the other hand, that allowed the 1st alternate, Eric Gundersen to get into the final as the eighth player. The results of these games are tallied below. It is interesting to note that all the games were won by Africa, Iberia, or Babylon and that Iberia would seem to be the 'best' nation to play. This year, we used the optional rule of allowing the purchase of one trade card off a trade card pile. This purchase was done as a separate 'Buy Trade Card' phase following the normal 'Acquire Trade Card' phase. This rule was in lieu of the standard rule of allowing the purchase on one trade card off the nine trade card pile. This rule resulted in many of the calamity cards coming out every turn. Also new this year, I used a scoring system that caused some ambiguity in who was going to get in the final round. 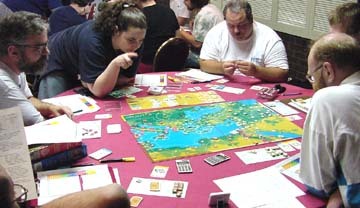 The final rank of all players was determined as a percent of leaders score plus the average score of the game divided by 1000. Therefore, it was possible that a person who scored low in a game with a high average score could get into the final game over a person who scored high in a game with a low score. My intent was to prompt the players with high game skills to help the players with low game skills so that everyone could have a fun game. The final game was a tough challenge. There were so many calamities each turn that it was a true fight for survival. In the first 2/3rds of the game the scores for all the players were very close. Eventually the calamities began to take their toll on several nations. Egypt fell out of the race and finished 8th due to being the recipient of barbarian hordes four consecutive turns. Babylon was hit with multiple calamities two turns in a row that ended in a stall on the AST. The troubles for Babylon maxed out when hit with both Civil War and the secondary effects of Epidemic in the same turn. Even with all its difficulties, Babylon, played by three-time champ Doug Gallullo, still managed to come in second. Crete started the game a little slow and that impacted its position the rest of the game. As I recall, on one turn the economic power house of Crete cashed in all the Ochre. 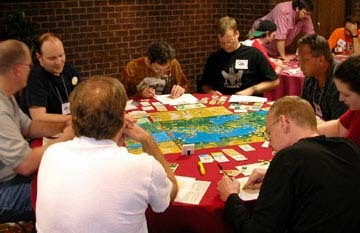 The game eventually became a three-way race between Africa, Iberia and Illyria which was determined on the last round when Africa and Illyria drew four calamities each while Iberia got away calamity free. Additionally, Iberia was fortunate enough to already have most of the Bronze, allowing two sets to be turned in for the purchase of 810 points of civilization advances on the last turn. In many of these games, players make classic statements that add some humor to the event. In the final game, the Crete player had the quote of the day "I don't mind getting hit with medicine (but getting hit with Epidemic is another story)". As for next year, I look forward to seeing you across the board when we do it all again.